Many health care facilities have been evacuated along the southeastern U.S. coast, as Hurricane Florence threatens the region. But at the Davis Community assisted living facility in Wilmington, North Carolina, they’re sheltering in place. “Those people who are critical care … it would be difficult for us to move them hours away,” CEO Charles Long said. “We may get stuck on the bus, in traffic, and it would be very difficult to care for them. There are close to 600 people taking shelter at the Davis Community, including patients, staff and their families, as well as any family pets, Long said. Diresha Rush, a clinical coordinator and licensed practical nurse at the facility, said that it’s her job to take care of her patients, regardless of the weather. “These people’s loved ones are counting on me to be here and take care of their loved ones through this, and to make sure they’re safe and [that they] make it out of this,” she said. Rush, who is staying at the home with family, said she brought 10 days’ worth of clothes, and that her real concern isn’t at the nursing home but rather for her own home, which is prone to flooding. “We’ll have to see what is left at home once this is all over,” she said. 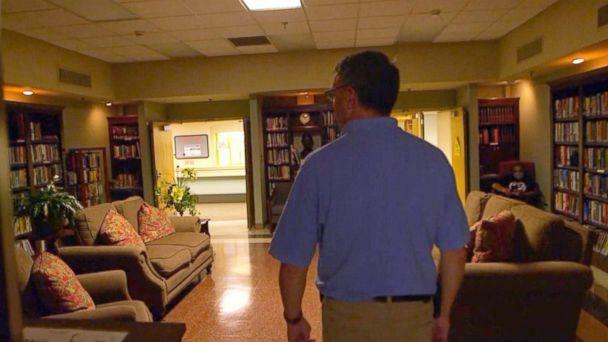 The campus, which holds a mix of assisted living, skilled nursing and rehab facilities, is doubling as a shelter for other facilities to weather the storm, too. And they are prepared, Long, the CEO, said. “We’re required to have food in an emergency for 72 hours, but we go beyond that here, so we have more than that,” he said. Inside the campus’ main storeroom, Long points out cereal, canned goods, different items for baking and other nonperishable items, such as granola bars and soda. Perishable items are in the freezer. As for drinking water, there’s enough of an emergency supply for each person to have one gallon a day, Long said. And if they lose access to the county’s water supply, they have a water tower with non-potable water onsite. Meanwhile, the emergency generator is prepped and ready. “We would not even know when the power goes out because we have an emergency generator [that starts] within three seconds,” he said. The Davis Community is fortified to withstand hurricane-strong winds. There are hurricane shutters on the windows to protect the glass, and the building is a single-story brick facility reinforced with cement and anchored down. “We’re not as worried about [the] structure as people with regular homes,” Long, who has worked at the facility for 30 years, said. “The last major hurricane was Fran [in 1996], and last time I was here working for several days … and someone got a call into me, and said, ‘There’s a tree on your house.’ … As I turned down my street, my house was up in the trees a little, and there were all these people and news crew there, and I was like, ‘Oh, no, this cannot be good.